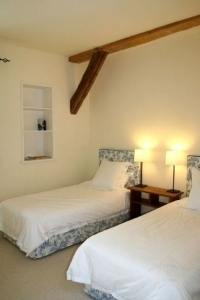 Les Hirondelles (The Swallows) one of three cottages, has been awarded four stars/\' keys\' by Clevacances. Clevacances in association with the Department of Tourisme has been set up to establish and ensure a consistent and high level of quality accommodation for guests. Les Hirondelles (The Swallows) has been sympathetically converted from an old limestone and timber framed barn into a home providing modern comforts. 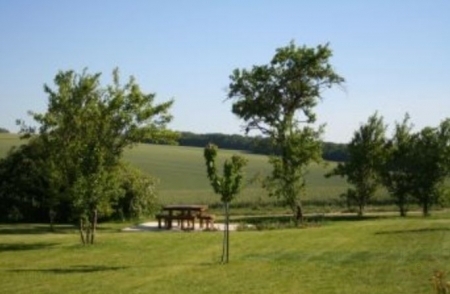 It is situated in the charming village of Eclance, on the borders of the ‘Côte de Bar’, Champagne Route. Les Hirondelles sleeps four and comprises large en-suite 2 bedrooms. The contemporary bathrooms comprise a bath, shower, handbasin and toilet as well as a hairdryer. The luxury main bedroom has a king size bed and satellite TV. Crisp white cotton sheets are provided along with towels. There is a large open plan living area with adjoining fully-fitted kitchen, dining area and lounge equipped with satellite TV, DVD and internet access. The charm of the old building has been maintained with exposed oak beams and with the stone walls in the double bedroom and sitting room. 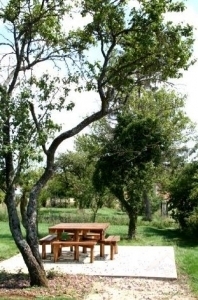 In front of the gite is a terrace with wooden garden furniture and parasol. Privacy is offered by the surrounding flower beds and trellis supporting climbing plants such as roses, clematis and honeysuckle. The large grounds and pool mean that you can both retreat and restore yourself in the quiet rural surrounds or if you so desire, interact with any other family or group staying in the other cottages. Close to the Champagne Route, the medieval towns of Troyes and Bar-sur-Aube, the 3rd largest amusement park in france, a regional naturel park with three large lakes; there is much to keep you occupied if you tire of relaxing by the pool or soaking up the beautiful panorama form the terraces in the garden. Payment may be made by cheque drawn on a french bank account, via PayPal (the secure online payment system) or via International Bank Transfer. The remainder is to be paid in euros on arrival along with a caution of 25% to cover any breakages. This will be repaid following inspection either on your departure or within 14 days of your departure. The price includes the beds already made up, towels in the bathroom, electricity, gas and for Les Tourterelles any wood used for the wood burner. Cleaning Service â�� You may reserve a cleaner in advance to the clean your cottage after you have departed giving you more time to enjoy the facilities. The cost for this service is 40â�¬ for Les Hirondelles and Les Moineaux and 50â�¬ for Les Tourterelles. Eclance 182 meters high. A small village of 124 people. La Ferme des Tourterelles used to supply milk to the cheese maker in the village but unfortunately is now no longer operational. Les Hirondelles is one of three cottages at La Ferme des Tourterelles. It is located in a small rural village close to two towns with a rich medieval history. A car is necessary. From the USA, fly to Charles de Gaulle or Orly airports in Paris and drive to Eclance. Aproximately 2.5 hours drive. There is a train service from Bar-sur-Aube, ten minutes drive from La Ferme des Tourterelles but a hire car is necessary to get around otherwise. None that I can think of other than a dictionary and phrase book to help with the french lanuguage! Mid May to End September but you can visit champagne houses any time of the year.